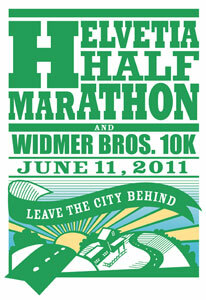 I have signed up and registered to run the 12th Annual Helvetia Half Marathon on June 9th, 2012. I have joined TEAM TRIUMPH, created by my friend and coach, Emily Segal, for motivation, running tips and moral support. Team Triumph is a global “team” of people coming together to support each other to participate in any sort of race sometime in the next 12 months. Some people are walking 5k’s; some people are participating in Full Marathons. Whatever that individual wants to challenge themselves with! Emily will be posting blogs and training tips and each of us will be sharing our journey, trials and triumphs! I would like to invite each of you to participate in either the Helvetia Half (there is also a 10k which is 6.2 miles) or pick your own event and join Team Triumph. The only requirement is that you commit to an event within the next 12 months! A great one for women is the Danskin Women’s Triathlon! I would love to do this but the locations are not that great for me right now. Check out THIS website to find all different types of activities and events near you! I would love to see a number of people get out and join me at Helvetia. You do NOT have to run! You do not have to do the Half Marathon! You can walk, jog, crawl, sprint or whatever! I will be sharing some of my training info and progress here on the blog. I encourage others to comment and share their training trials and triumphs, too! I am excited and nervous! So far, I have gone on two walk/jog’s in the last week or so. I have jogged about a mile and a half, downhill, both times. As we move forward I will be adding more distance. Check out this blog post by EMILY SEGAL to get some inspiration and ideas on how to start running if you never have before! and I am going to read Born to Run. Comment and let me know what you think!! Yay! LOVE it! Corrie you are going to love running a Half Thong!! I am very afraid. Reason being is because of the weight I have gained back. I was much smaller and "quicker" in 2006. I know when I did my first 26 miler I was heavy and did ok. I know this will help kick me back into gear for having a "goal". Plus I know I will need to throw in yoga to help prevent anymore issues that I already have. This entry was posted on August 18, 2011 by Corrie Beebe in friends, health, training.